Dynnargh dhe Logh. Welcome to Looe. I didn’t see this sign until our last evening. But I did feel very welcome. Our last night in Looe was just about as perfect as it could be. The previous days had been stormy, but massive rains left everything feeling clean and fresh (and flooded – there were floods throughout the area). 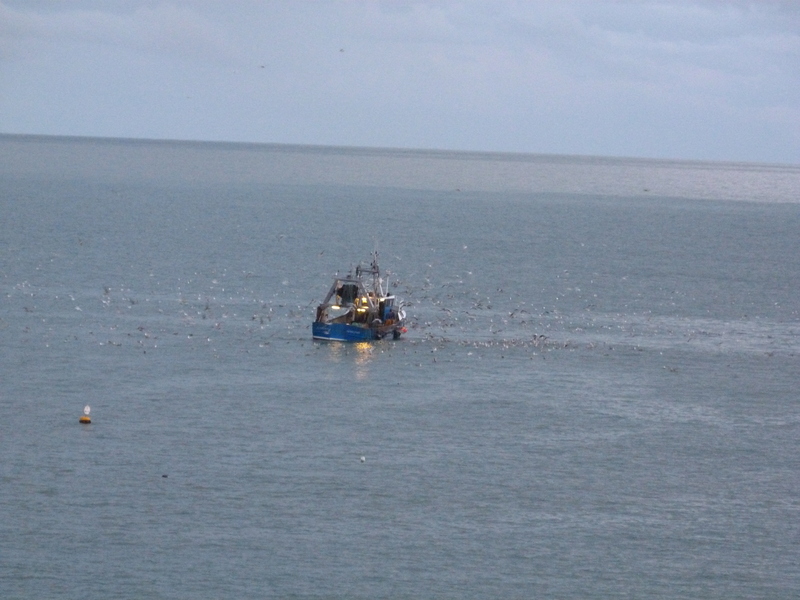 The early evening tide was very high, the fishing boats were coming in laden with mackerel and accompanied by masses of seagulls. 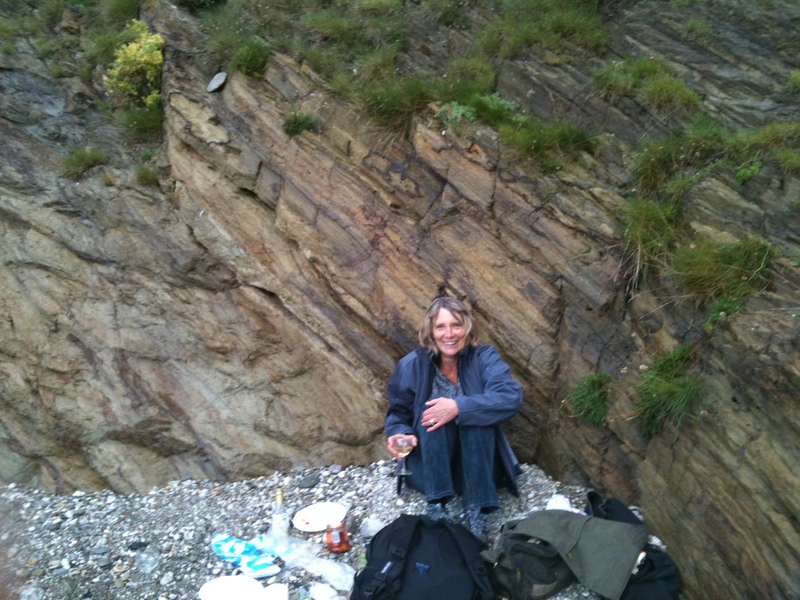 We walked up the cliff for pre-dinner drinks at our “lounge” in Hannafore, overlooking the sea. A last talk with the friendly bar tender (who is writing a book called “My Life Behind Bars”) Then as the sun was setting, we went down to East Looe for a dinner at Papa Ninos – a little restaurant that has only 5 tables and makes everyone in the room feel connected to each other. As a starter, we had the best mussels we’ve ever eaten. They were fat and flavourful with a Marinière sauce of white wine, cream, garlic, onion and parsley that was sublime. I’ve had this dish in a number of restaurants in the area, and I would have to say it was the best at Papa Ninos. I’ve included my Moules Marinière recipe if you want to try and make them at home, although I can’t guarantee that they will be as wonderful. Fresh mussels have been a revelation. I had red mullet that was grilled to perfection, and Tim had Turbot in a pernod sauce that was exquisite. In our 12 days in Looe we had, between us, 18 different varieties of fish and shellfish. This dinner was certainly the cap to an extraordinary seafood adventure. 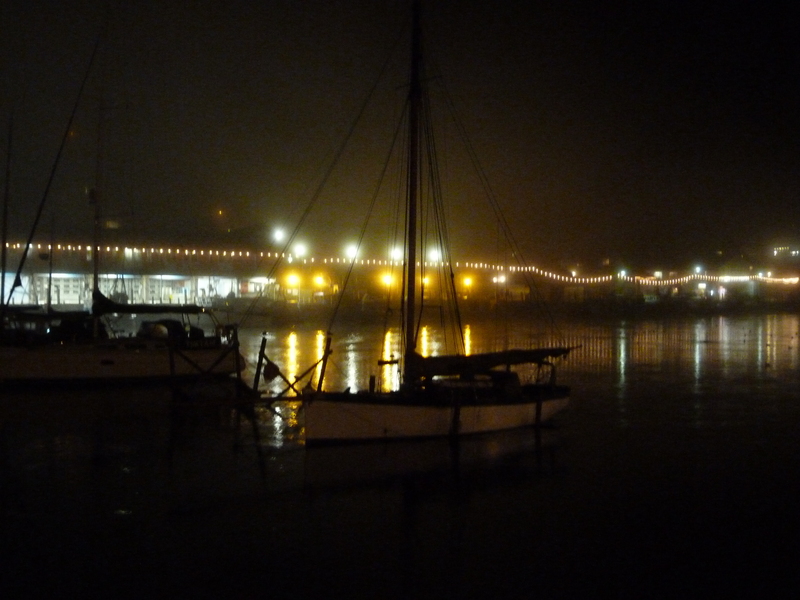 The harbor was dark and misty as we crossed the bridge to go back to West Looe and finish the evening singing with the locals in The Jolly Sailor. We’d been there the week before and were welcomed as old friends. The songs poured out, accompanied by guitar, bodrun, accordion, harmonica, banjo, recorder, penny whistle and that wonderful bottle cap rhythm stick instrument that probably has a name that I don’t know. “It’s all the young fellows have gone to the city. All the young fellows have gone to the town. 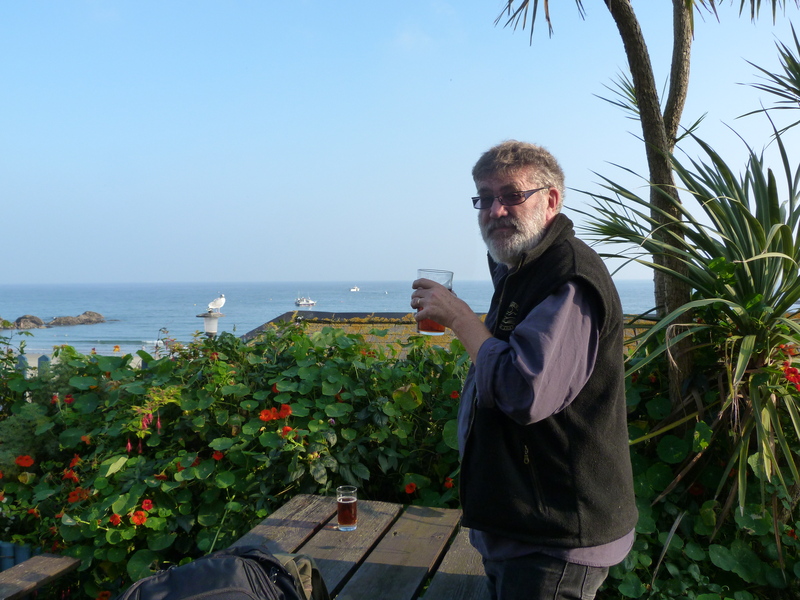 We drank local ales and Cloudy Cider and bid a fond farewell to Cornwall. 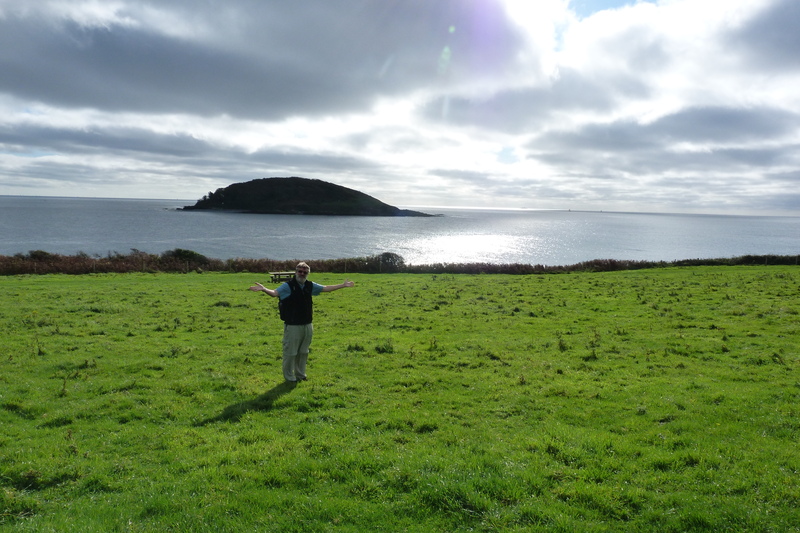 Looking for day trips from Looe, we decided to go to Plymouth, about an hour’s bus ride away. For North Americans, the big thing about Plymouth is that it is the place that the Mayflower sailed from. Filled with Pilgrims or “English Dissenters”, the boat’s inhabitants were looking for a new life in a land of religious freedom. The rest, as they say, is history. For the English, Plymouth was a major shipping port, and with neighbouring Davenport as a shipbuilding and dockyards town, the area was of great strategic importance during the Second World War. That, unfortunately, led to it being especially targeted by the Germans. The Plymouth Blitz consisted of 59 different bombing raids on the city and resulted in the destruction of virtually the entire city centre. We arrived in Plymouth on a lovely sunny day. The harbor was busy with picturesque sailboats and tourists. It was the first day of English half term and there was a feeling of carnival in the air. Our time in Plymouth was limited, so we decided to focus on the art exhibit “British Art Show 7: In the Days of the Comet”. The British Art Show happens only once every 5 years and is recognized as the most ambitious and influential exhibit of contemporary British art. There were 5 different galleries involved with the exhibit in Plymouth, so traveling to each of them would give us a unique view of the city. Our first stop was to be “The Slaughterhouse” in the Royal William Yard. To get there we followed directions from the tourist information office that led us along the Grand Parade, a promenade along the oceanfront. Prominent on the waterfront is Plymouth’s Lido, and although I have always known the word, I never really knew what a Lido was: “A public open air pool or beach”. The Tinside Pool from Plymouth archives. circa 1958. Plymouth’s Lido is the “Tinside Pool”, built in Art Deco style 1935. It survived the bombings, but it was apparently a rather convenient marker for the German raids. A 55-meter diameter semi-circle stretching out from the cliff edge, the Lido has a large fountain in the middle. 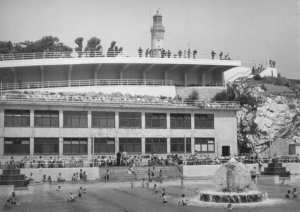 There are segregated changing rooms and terraces where orchestras used to play above the bathers. It fell into disuse and was closed in 1992, but it has since been restored to its Art Deco glory and was reopened in 2005. Although only open in the summer months, there were a couple of intrepid swimmers on the beach directly beside the pool. It was that kind of a day. But as our walk progressed, the day turned cool and we went through other parts of Plymouth that have yet to be restored. In fact, we were surprised that the tourist office sent us along Millbank road, a very disheveled part of town. 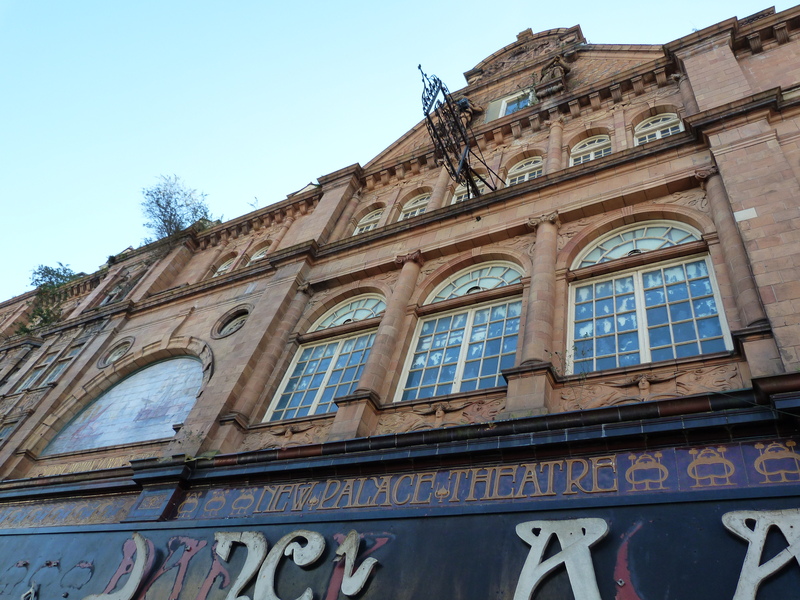 We passed by the marvelous but entirely decrepit Victorian New Palace Theatre. The New Palace Theatre opened in 1898, and most of the great vaudevillians played there over the years. Looks like all of the original Victorian fittings are still there, even down to the rigging for the fly gallery. It is horrible to think of something that beautiful being allowed to crumble. After a much longer and uglier walk than we anticipated based on the directions from the tourist office, we arrived at The Royal William Yard. This is a fabulous renovation project, still in its early stages. The former army barracks are being rebuilt as luxury condos and the surrounding buildings are restaurants, stores and galleries. Royal William Yard marina. The bakery/restaurant is straight ahead. We had a good tapas meal at the renovated Bakery building and the gallery we went to was in the old slaughterhouse. 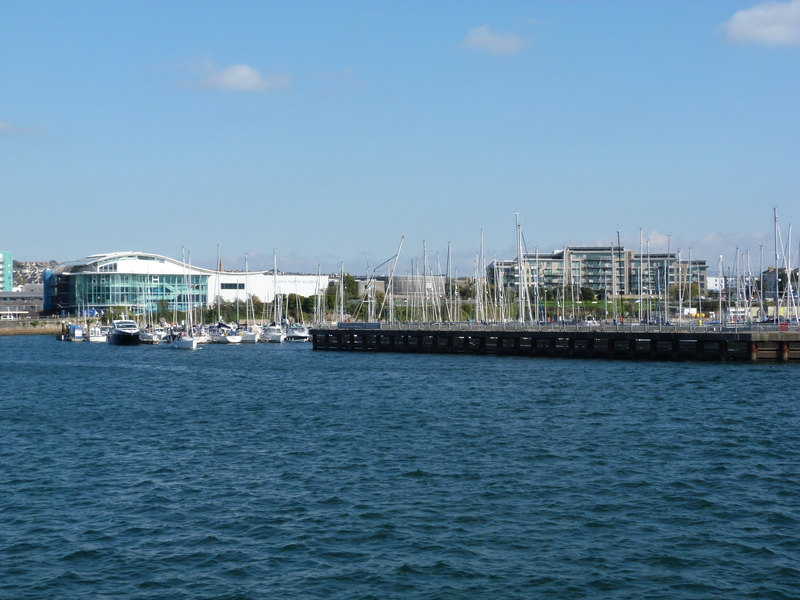 With a marina in the centre, this area is destined to become incredibly fashionable, similar to the Distillery district in Toronto. Except for one problem. You’d have to want to live in Plymouth. Although the gallery itself is a gorgeous space, the art show was a huge disappointment. 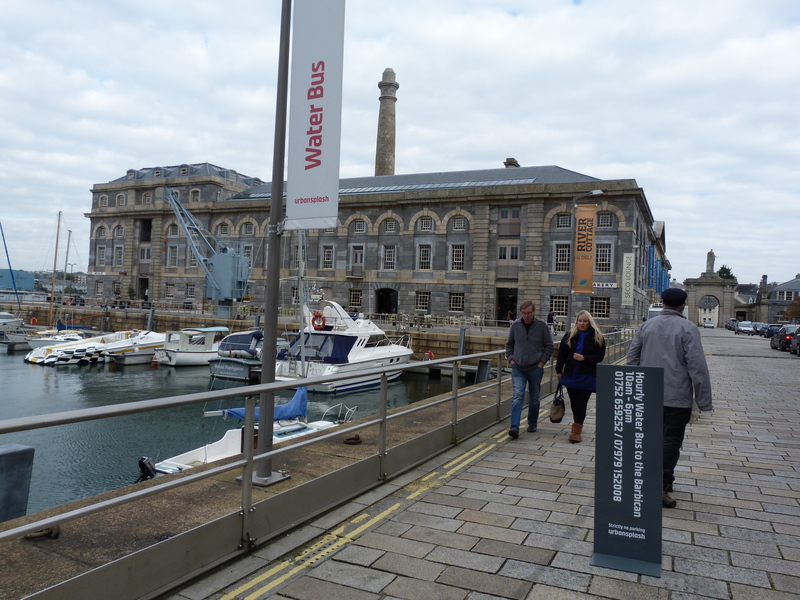 We travelled to the next location, and on and on, getting lost and frustrated as we negotiated the streets of Plymouth to get to the Art Gallery, the University, the Arts Centre and the Museum. Rebuilding after the war, much of the city centre is grey concrete and uninspiring. Much of the artwork, which is touted as cutting edge, is in fact idea-driven, technically uninteresting and empty. There are only a couple of the 39 artists whose work touches us in any way. George Shaw is up for the Turner Award and we hope he’ll win. He paints with Humbrol enamel paints, the kind used for models, and his work reflects the poverty of growing up in Coventry council estates. They are dark, lonely and melancholy. Wolfgang Tillmans has a huge photographic print (the size of a whole wall) that was made without a camera. He exposes photographic paper to points of light, creating textures and colour that are really uncanny. By the time we had been to all of the art venues, the day was overcast, and so were we. Plymouth has no “feng shui”, says Tim. We caught the next bus back to Looe and treated ourselves to a wonderful fish dinner on the wharf at The Old Sail Loft. The Old Sail Loft is part of the “Fish Fight” campaign, fighting for sustainable fishing practices. http://www.fishfight.net/the-campaign/ We had a delicious meal of fish that had “extremely low food miles”. It was caught just off the coast by Looe fishing boats, and travelled only 200 yards from the boat to the restaurant. It was a perfect balm to warm us from the chill of Plymouth. We were very grateful for each mouthful. The Eden Project has already reached mythic proportions. Conceived by a group of visionaries in the early ’90s, it has become, in 10 short years, a beacon of hope and inspiration around the world. We travelled to The Eden Project by bus. If you arrive by public transit you get £4 off of the admission price. The bus drove through the small villages of Cornwall, into the middle of countryside, into the middle of an idea. “There’s no rule book for a successful future, so imagination, creativity and enterprise are needed to try to find new solutions” (from the Eden Project Guide). 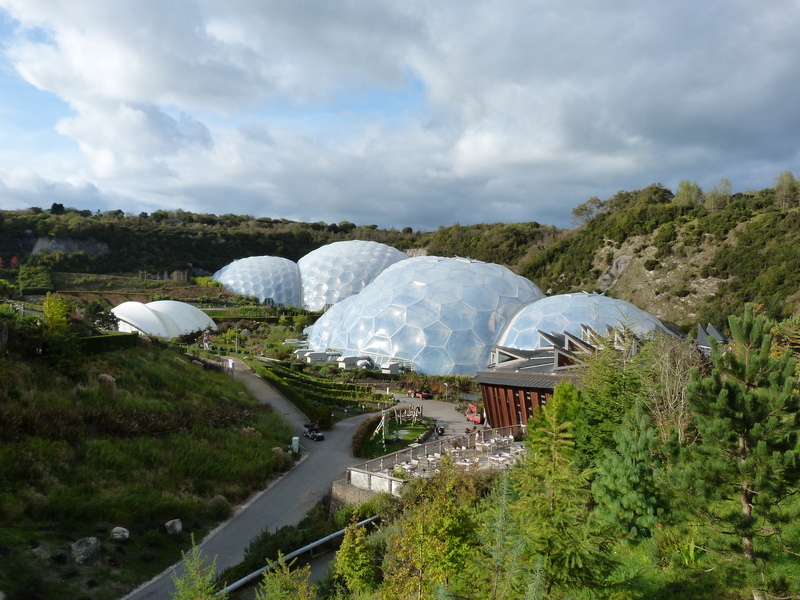 With funding from the Millennium Commission, and a variety of public and private sources, the Eden Project bought an old, steep sided clay pit, 60 metres deep, with no soil. They filled it with soil made from waste materials (seriously, they worked with Reading University to make soil from mine wastes, composted matter and worms), populated it with a huge diversity of plants (“the plants that changed the world”) and built structures and infrastructures that have resulted in an astonishing educational centre. 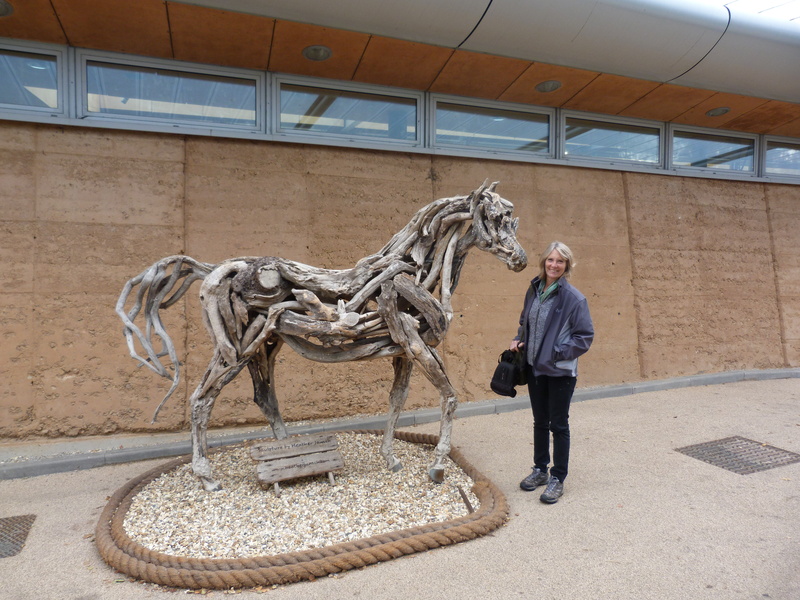 We were greeted by one of the most wonderful horse sculptures I have ever seen, made entirely from driftwood and capturing the grace and elegance that is the essence of a horse. Once inside the grounds we worked our way through the zig zag path of the “Outside Biome, the one with the sky for the ceiling”. Plants for a changing climate. An unusual succulent, living outside. 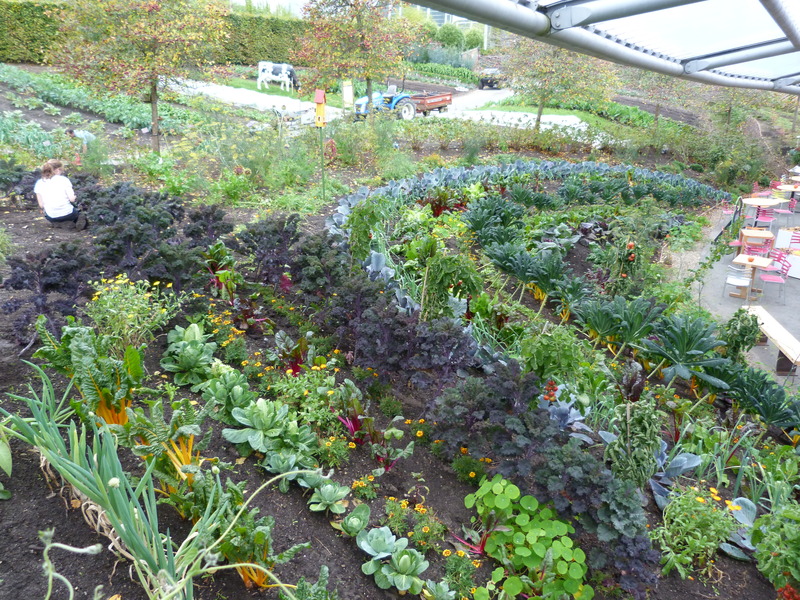 The plantings explore the crops used for food, fuel, medicine and materials. There is a whole section devoted to plants used in mythology. The project engages in “extreme gardening”, developing plants that will survive changing conditions, and, of particular importance for the Outside Biome, will develop strong roots to hold soil on slopes. All of the displays combine stories with plants. 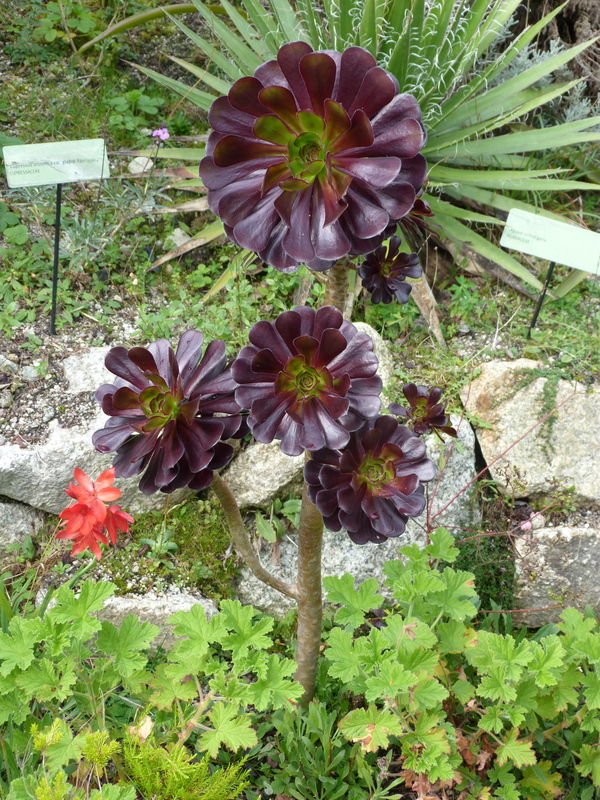 Founder Tim Smits realized that “plants could be made far more interesting by weaving human stories around them, tales of adventure, emotion and derring-do” (from the Eden Project Guide). Everywhere we go there is information, stories and artwork. 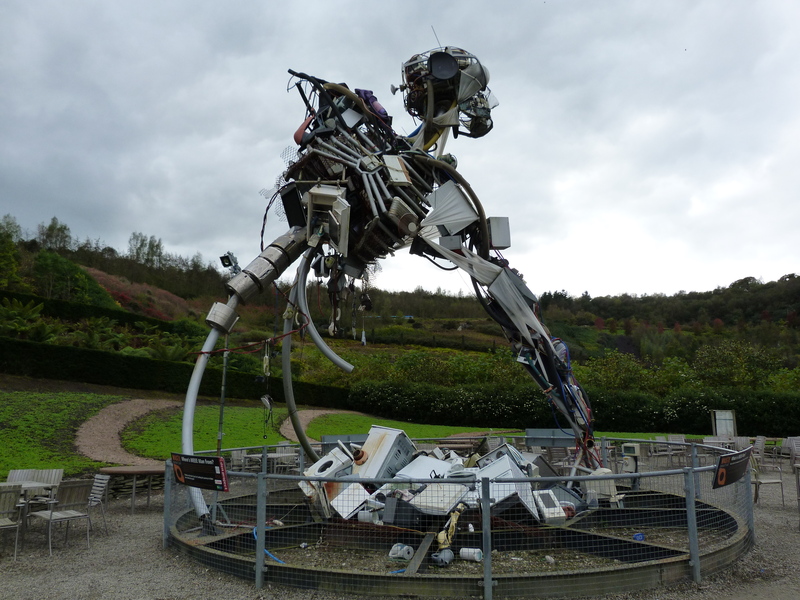 The Weee Man is a giant sculpture created by Paul Bonomini made from all of the Waste Electrical and Electronic Equipment that one person throws away in a lifetime. He weighs 3.3 tonnes. There is an outside stage for performances. Bands from around the world play in huge outdoor concerts at Eden. In the winter it is converted into a magical ice rink. The “Inside Biomes”, constructed in huge geodesic domes, are the Rainforest Biome and the Mediterranean Biome, each with its own climate, propagating and cultivating the plants from those regions. Inside the Rainforest Biome it is heavy and hot. With an average temperature of 25° C and humidity of 90%, the signs warn us to make sure we have water with us and not to climb too high if we have a heart condition. The Biome is divided into regions: Tropical Islands, Malaysia, West Africa, and Tropical South Africa. There is information and displays on crops and cultivation as we pass by banana, rubber and coffee trees, spices and waterfalls. We’re introduced to “Architecture Sans Frontières”, a program that designs and builds shelters for people in disaster zones. It is overwhelmingly rich, dense and authentic. We took a lunch break in “The Link” which joins the domes. The cafeteria-style café has a range of wonderful food made on site – earlier in the day we could watch people making the pizzas and bakery items at long wooden tables. Wooden slabs functioned as our plates/trays and we loaded them up with Greek salad and broccoli, leek and cheese torte. Signs told us to remember what we have taken to eat and to pay for it once we had finished. A trusting and gentle environment. The Mediterranean Biome is divided into the Mediterranean, South Africa and California. The air is cool and dry. We’re advised that the Biome doesn’t shield us from ultraviolet rays and that on sunny days we’ll need our sunscreen lotion. But it is autumn now, and I realized that the Biome is seasonal – we have not stepped into an artificial recreation of a hot Mediterranean day. Rather, it is autumn inside, as well as outside. This is not a recreation — it is a functioning environment. A fish stew is cooking on the “outside” stoves. We see olive, lemon and orange trees, grape vines, a huge range of pepper plants. We smell sage and sweet scented plants used for perfumes. 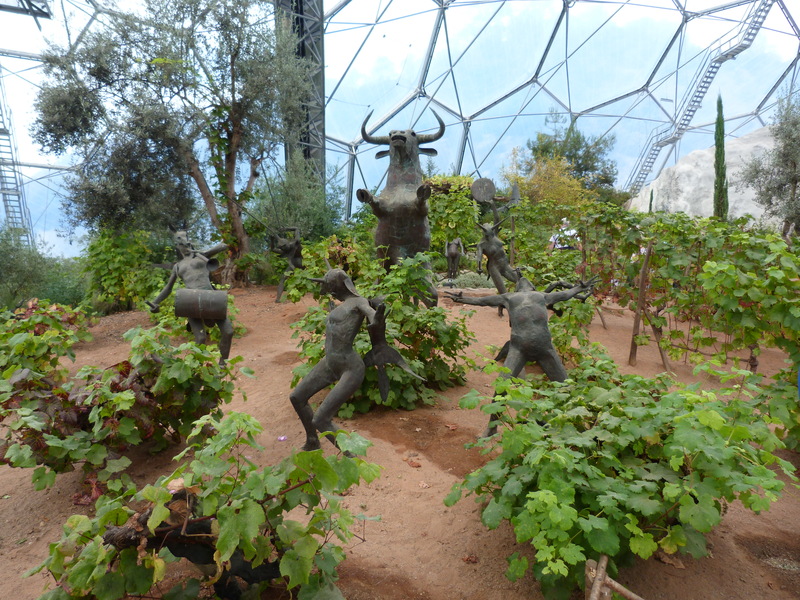 There’s a great sculpture dedicated to a Bacchanalian feast. We don’t quite feel like joining in, but there are locally produced wines, should we feel like imbibing. The “Core” is the education, arts and events hub, from which the project operates school programs. “It isn’t just a building. It’s a metaphor”. The building design is based on a sunflower and at its centre is a 75-ton Cornish granite sculpture of a seed that “plants a symbol of hope, to grow ideas for the 21st century”. We finish our day at the visitor centre that sells Eden grown plants and a wide range of responsibly made items and foods. And then there was the day we had a picnic. The weather has been, for the most part. “Sunny, with cloudy periods”. On one particularly sunny day, we decided to have a picnic. There are wonderful local foods available here. Right up the road from the cottage, there is a good independent grocery that carries a range of local cheeses and specialty items. I loaded up with some Cornish “Crumbly” cheese (nutty and a bit cream/dry), Cornish Blue, roasted peppers, marinated artichokes, olives and a loaf of crusty bread. We got some locally smoked wild salmon, a little bottle of Cornish apricot Mead and headed for a rocky beach just east of Looe. The sun was baking hot as we arrived. We settled into a sheltered rock face, kicked off our shoes and started to unpack the picnic. Admittedly, there were some clouds in the sky, coming in fairly quickly, but they seemed to fit into the idea of “ … with cloudy periods”. We had just tasted the Mead (very yummy, tasting of sunshine, perfect for a picnic) and served up first helpings of fish and cheese when the rain started. There was really no place to take cover, and it looked like the rain would be over by the time we packed everything up. So all we could do was to try and save the bread from getting too soggy and the Mead from getting watered down while we kept eating. The rain let up after about 15 minutes. We were pretty wet, but clean and happy. The hot sun came out, we packed up the sodden remains of the picnic and walked the hills to dry off before heading back to the cottage. Our little cottage has no view of anything at all. It is a cute place, but it easily drives us to cabin fever. 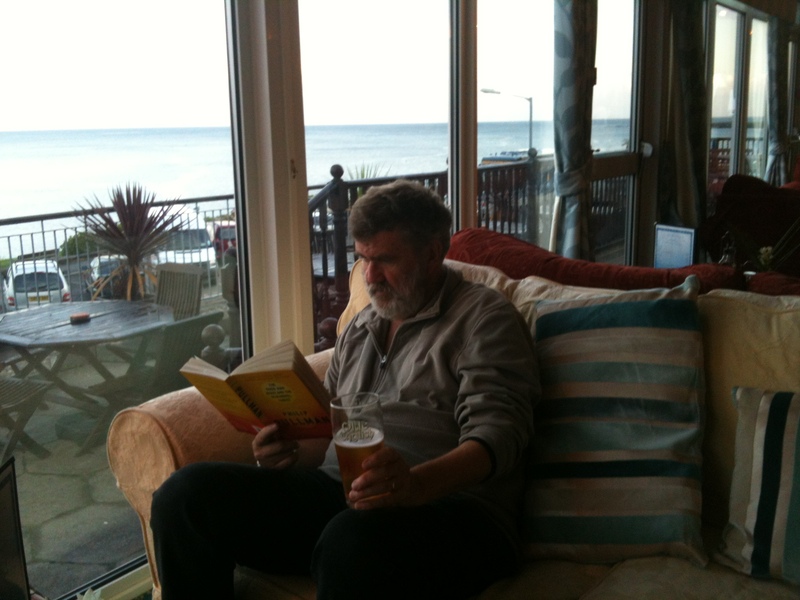 So we have adopted another “lounge” overlooking the sea for our early evening pre-dinner drinks. Just around the bend from West Looe is the small community of Hannafore. Sitting high atop the ocean cliffs, with spectacular views, is the Hannafore Point Hotel. Large overstuffed couches sit beside the full-length windows of the bar. With few customers, we have the place entirely to ourselves. We settle in with books and glasses of wine to watch the sunset. A good, dry ending to the day. Moors dominate the landscape of so many English novels. But it seemed like the only words ever used to convey this foreign setting were “desolate” and “windswept”. As a Canadian, this didn’t give me a lot to go on. 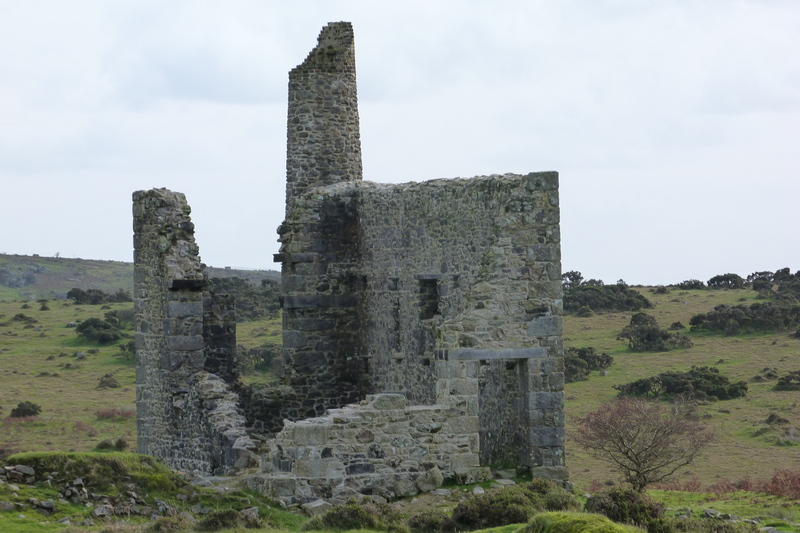 So when Tim suggested that we head out to the Bodmin Moor (featured in Daphne Du Maurier’s “Jamaica Inn”), I hoped I could add few more adjectives to the description and be better able to understand this mythic setting. Because we are travelling without a car, our choices are dictated by the schedules and routes of trains and coaches. 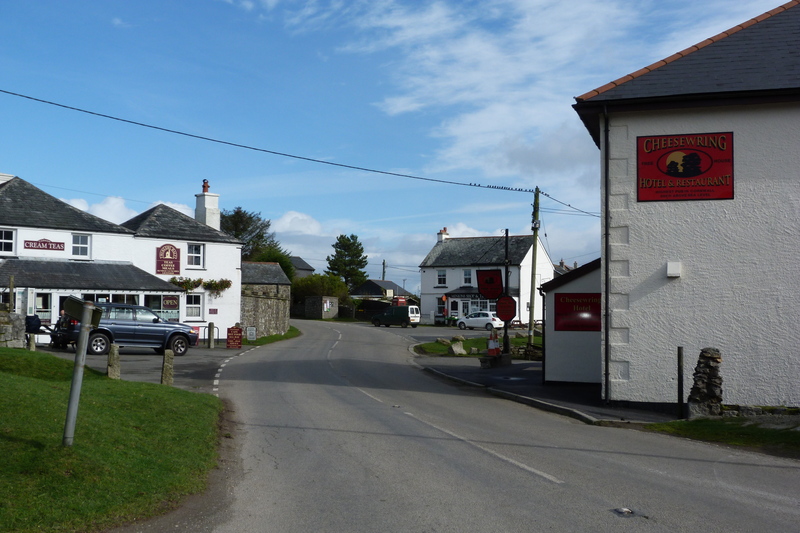 The town of Minions is a little over a half hour away by local bus and as it is right on the edge of Bodmin Moor it was a good place to start our moor adventure. Minons sits 1000 feet up from the sea level, so the bus ride from Looe was steep and twisty. The town was prosperous in 1863 when Captain Jack Clymo discovered a vein of copper ore. Over 4000 people were employed in the mines. But todayall that remains of the industry are over 20 derelict mines, dotting the moors. The town consists of two shops and small group of cottage homes. The bus driver let us off with the reminder that there is only one bus out of Minions, coming through 4 hours later. And not to miss it, unless we wanted to spend the night in the moors. The minute that we walked into Bodmin Moor, I realized that the first and best word to describe a moor was no other than “desolate”. And with the wind whipping our faces so hard that our words were snatched before they were heard, it was definitely “windswept”. Startlingly cold, spongy underfoot, with small tufts of gorse, it is the first place I have been in England that is totally open and flat. Your eyes play tricks on you. It is impossible to tell how far away or large the landmarks are. A 2-foot high marker can look like a distant tower. A slight roll in the foreground persuades you it is the edge of a non-existent river valley. I felt a slight panic at the idea of getting lost, and watched constantly for any markers I could see. 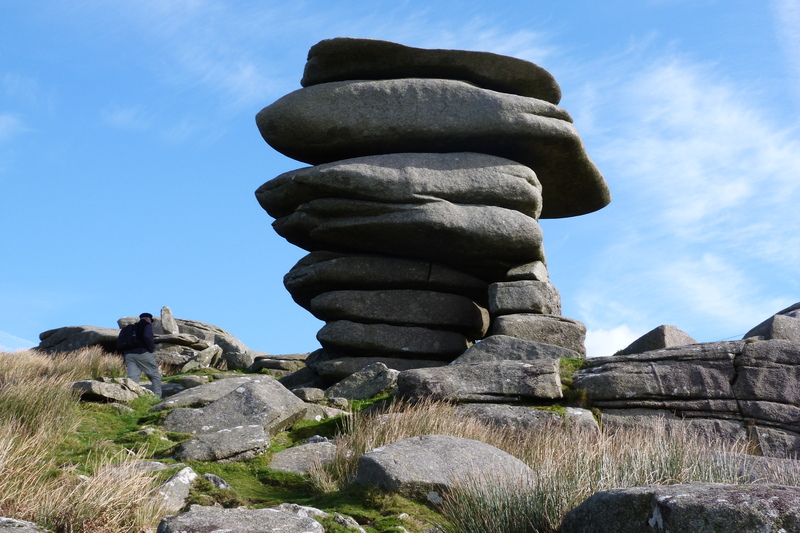 The Bodmin Moor has been a huge source of granite throughout human history. These days, it is primarily used for grazing ponies, sheep and cattle. The high area where we were hiking is dominated by “tors” (rocky peaks) and “clitter” (granite strewn slopes) and an exciting layering of history, both geological and human. As we walked into the moor, the first thing we saw were the “Hurlers”, 3 Bronze Age stone circles, with 35 m diameters, grouped together. 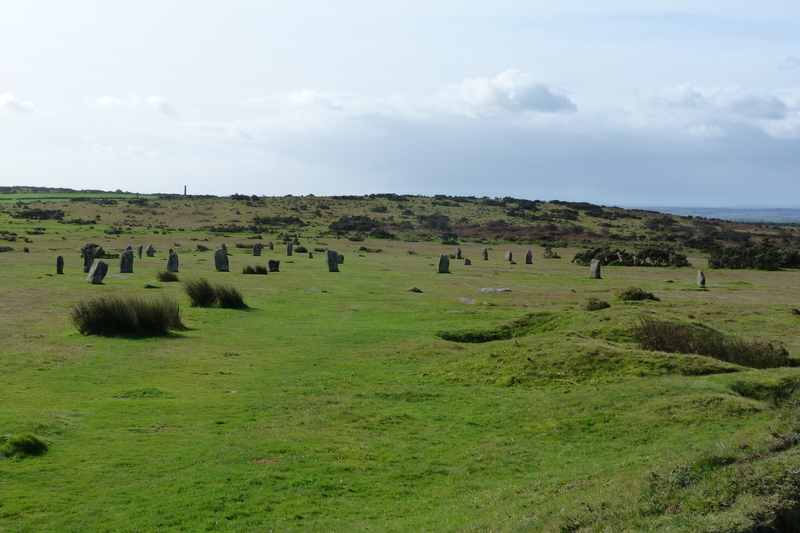 Legend has it that men were turned to stone for playing “hurlers”, a Cornish game, on the Sabbath. 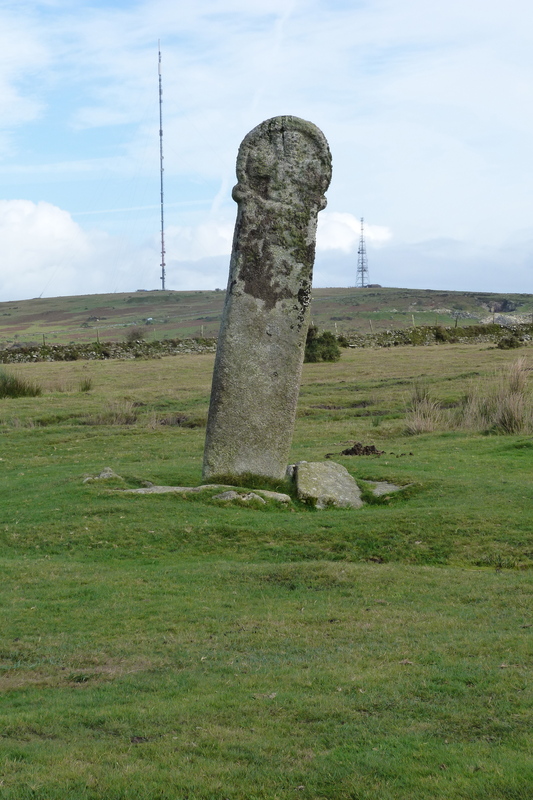 A ghastly fate – I am not sure that even as a rock I would want to have to stand out on the Moor for eternity. From the Hurlers, we walked up to the Cheesewring atop Stowe’s Hill. This precarious looking pile of rocks is a natural formation from erosion during the ice age. They are astonishing natural “sculptures” of the granite. They are an unnerving presence in the landscape. The Cheesewring. Note Tim in foreground, left, for scale. “If a man dreams of a great pile of stones in a nightmare, he would dream of such a pile as the Cheesewring.” Wilkie Collins. We decided that it was time to find somewhere a bit out of the wind to eat our picnic lunch, so we headed to one of the derelict 19thcentury mines, and managed to find a corner in which to eat. Of course there wasn’t much protection when the rain started. Although it was really just a light misting, we decided that we wanted nothing more than a cup of tea and headed back to Minions to warm up. 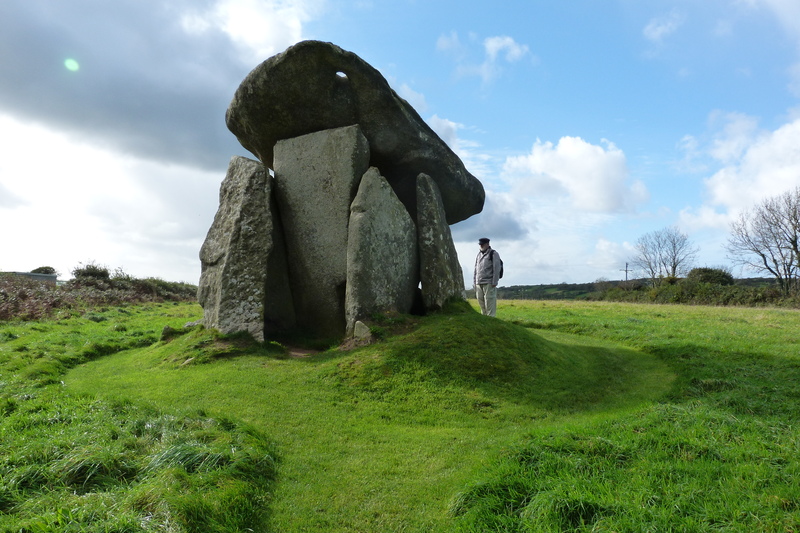 We had a little over an hour before the bus, so we wanted to try to see Trethevy Quoit, about a mile away. We have a good ordinanace map, but not everything is marked so we followed directions from the proprietor at the tea shop at Minions. We left Minions at a brisk clip, passing “Long Tom” or Longstone, a medieval wayside cross by the side of the road, and headed along the country lanes. We were determined to get to Trethevy Quoit, but knew that we had to get back to “Commonmoor”, just outside of Minions, to catch the bus. But we weren’t entirely sure where either Trethevy Quoit or Commonmoor were, and it was starting to rain. Panic began to set in as we ran. “Just one more corner. Just around this bend?” And suddenly, behind a couple of quite ordinary houses, was this huge 9-foot high stone structure. Trethevy Quoit is a Neolithic portal burial chamber. Originally covered by a mound, it consists of 5 standing stones, topped by a massive (20 ton) capstone. One of the supporting stones has fallen into the chamber, and the capstone has since slide onto an angle, but it is remarkably in tact. 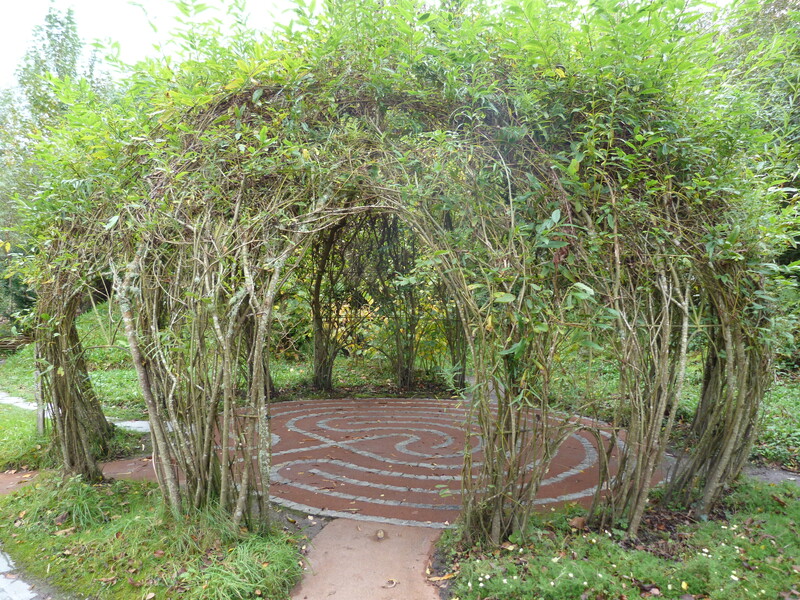 It is thought that the Quoit was used as a burial mound or portal to the other world. It was worth the run and the panic. And clearly the luck of the ancients was with us because we were late for the bus, but the bus was also, unusually, late and we caught it with 2 minutes to spare. Back in Looe, we capped our day of Neolithic adventures by a night at the Jolly Sailor pub, just down the street from our cottage. The Jolly Sailor is Looe’s oldest pub and has been going since 1516. A group of locals assembled with guitars, penny whistles, accordions and mandolins to sing songs of love, protest, sea faring and adventure. Singing along, pint in hand, we felt a bit of Cornwall had definitely entered into our souls. 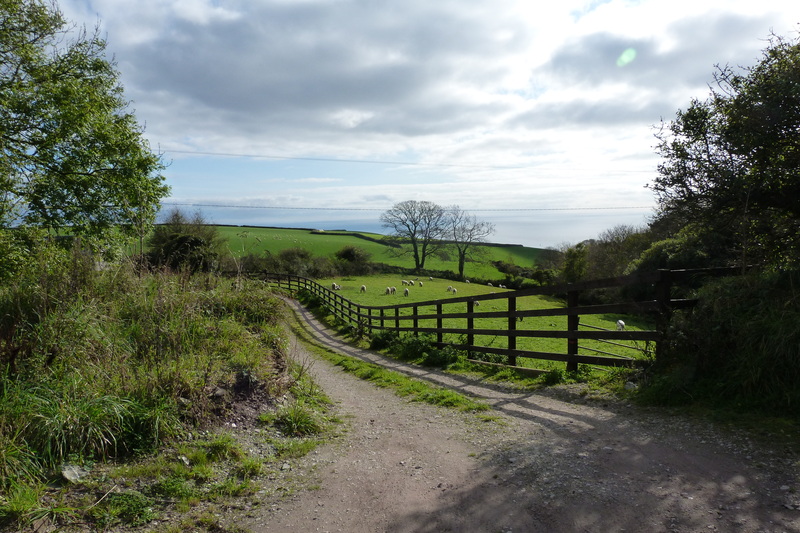 The coastal path from Looe to Polperro is well worn and friendly. 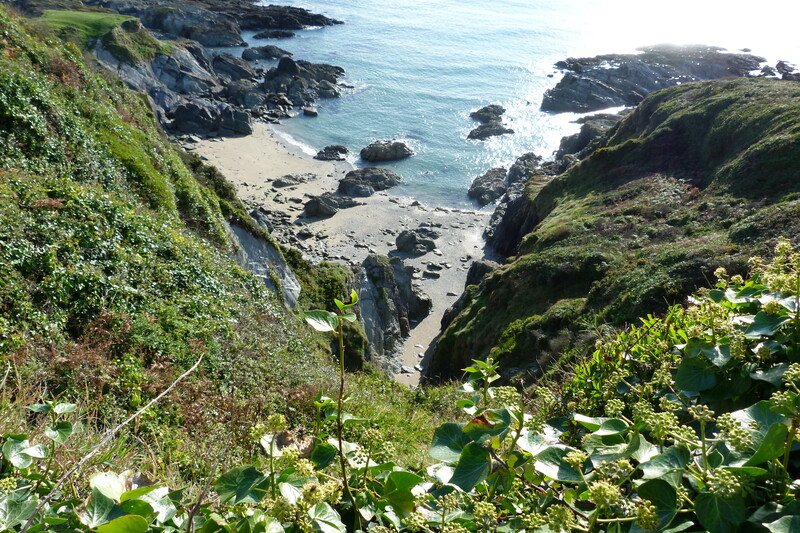 Approximately 5 miles, the hike takes you along the cliff edge with magnificent views of the rocky beaches below. It was a gorgeous warm day of mixed sun and cloud, so, with water bottles and snacks in hand, we headed out. We meandered through fields of cattle and yellow flowered gorse bushes (said to flower every month of the year), passing the occasional dog walker and being passed by more serious hikers and making sure to stop and breathe in the sea air. We arrived in Polperro about 2 hours later, ready for a good pub lunch. 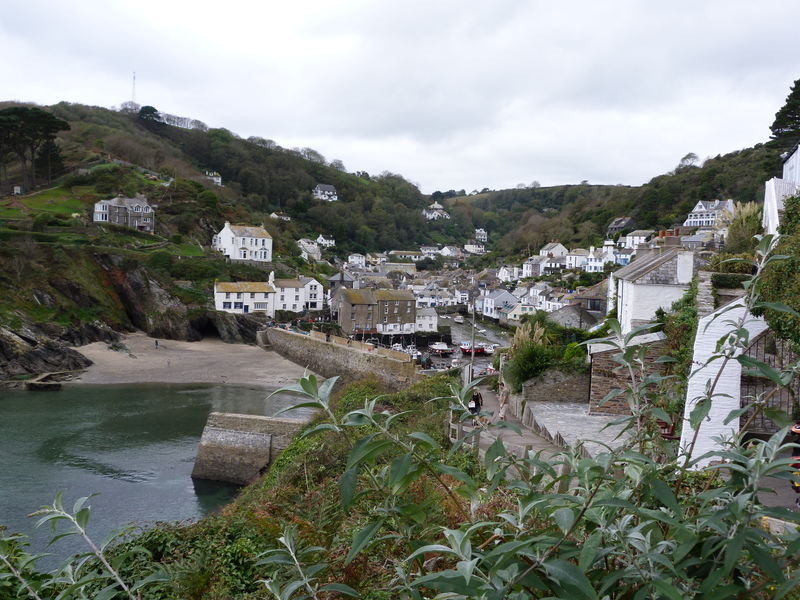 Polperro is an even smaller fishing village than Looe, with tiny houses clustered around the harbor. We were pretty tired and hungry from our hike and we headed to the first pub we saw, The 3 Pilchards. It is the oldest pub in Polperro, and has dark low ceilings and lots of homemade food. A Pilchard is a kind of sardine and was the catch that made Polperro a vibrant village in years gone by. Tim opted for the “2 Pilchards Plate” which, when it arrived, was a mound of shrimps, prawns, calamari, crab, smoked pilchard and mussels. I had ordered the Thai fish stew (a specialty of the house), but Tim’s plate was enormous and it took both of us to polish it off. The fish was some of the freshest I have ever tasted and went beautifully with Sharpes Ale, a local from Rock, Cornwall. Because Polperro is small, the proportion of tourists on a fine Sunday was rather off putting, so we decided to travel on fairly quickly. Not ready to finish our hiking day, I suggested that we push on to Lansallos, which I had heard of in our search for cottage accommodations. 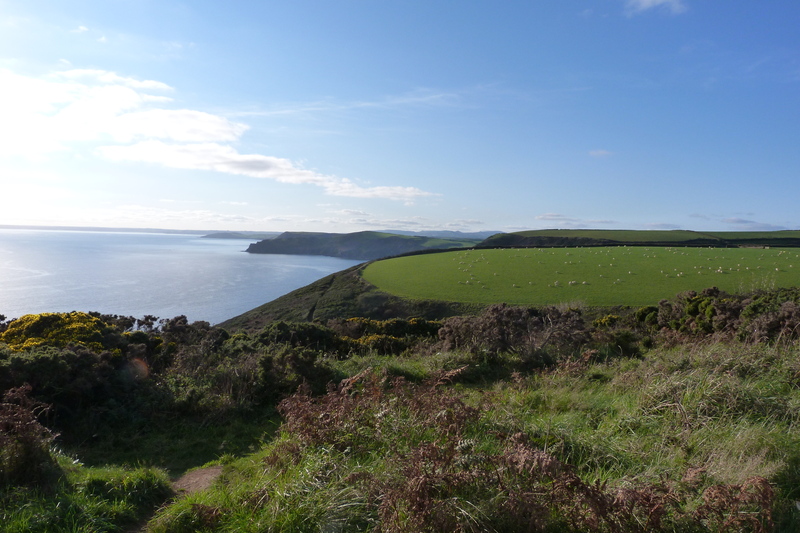 We decided to walk along the roads inland from the sea to get there, walk back to Polperro along the coast and then take a local bus back to Looe in the late afternoon. Going inland, Lansallos was about 3 miles away. It was a beautiful country walk with tall hedgerows on either side of the road and picturesque farms dotting the landscape. 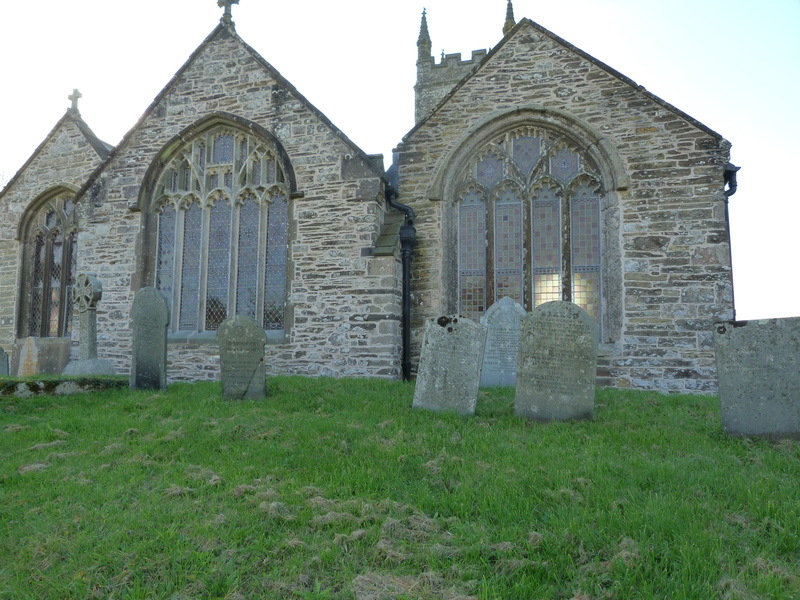 Lansallos consists only of a few houses and a magnificent Norman church built in 1321 on the site of a Celtic chapel. An incredibly peaceful site, the Church is surrounded by a very old cemetery. One of the gravestones is dedicated to: “John Perry Mariner, who was unfortunately killed by a cannonball by persons unknown”. Poor John Perry was only 24 when he died, and the imagination boggles at this unusual death in 1779. 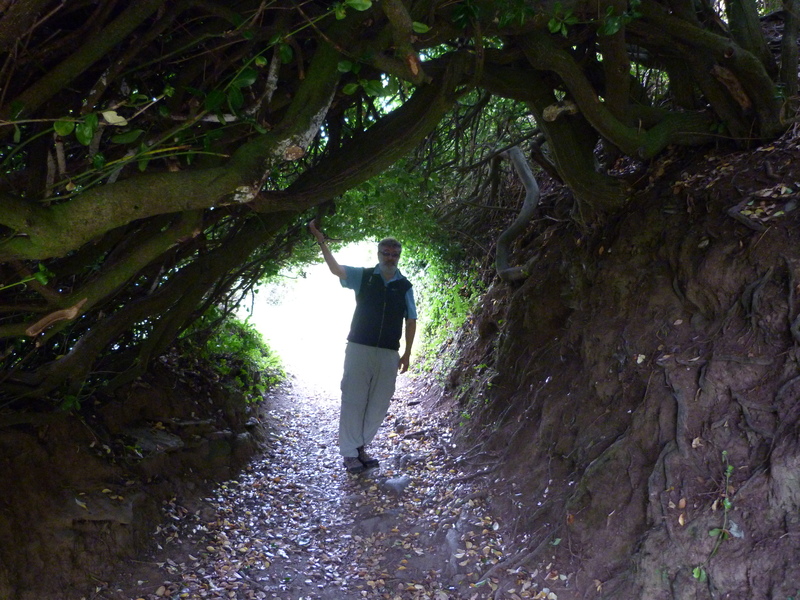 We saw not a living soul in Lansallos. “Benath Dew Genough Why” – “God be with you” in Cornish. We headed back along the coastal hike. We probably should have found out more about it before heading off. 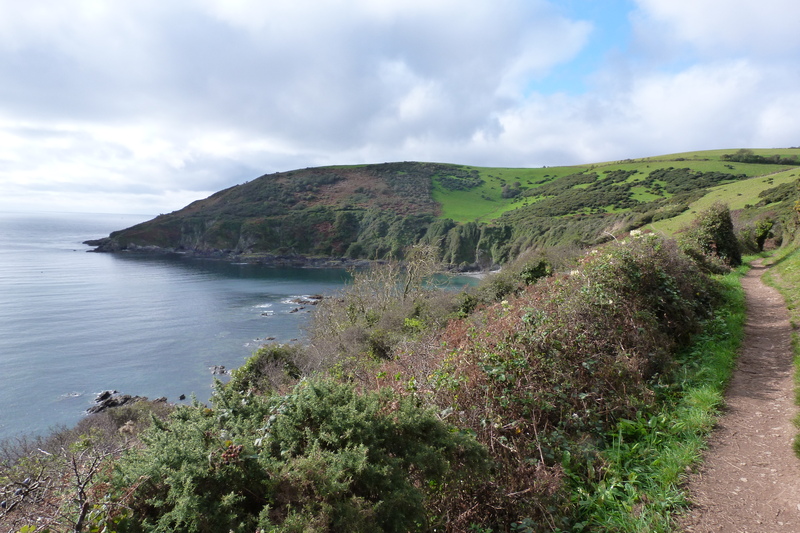 The hike from Lansallos to Polperro is, to say the least, a challenge. Some of the cliffs have steps to help the weary traveller, but they really serve to let you know how high or low you are going. 168 steps up, followed by 130 steps down, followed by… Tim kept chirping up “We’ve just climbed an 8 story building. That was 13 stories” etc. Not only that, but the path is right on the edge of the cliff. It is a severe challenge to anyone suffering from vertigo. Thankfully, there are occasional benches to help you to recover between climbs. It was an incredibly strenuous hike, especially for two rather inexperienced hikers. But it was astonishingly beautiful. Two hours later, with the sun just starting to set, we hobbled into Polperro to catch the bus back to Looe. Adding it all up, we put in well over 12 miles. Triumphant, we got back to the cottage, gratefully soaked our aching joints in deep baths, made pasta and curled up in front of a cozy electric fire. As odd as it sounds, we decided to take a vacation from our vacation. We booked a cottage in Looe, a fishing village on the Cornish coast. Tim’s mission on this trip is to do a lot of walking on the coastal path and Looe, directly on the path, was advertised as a picture perfect English fishing village. We left London via Paddington Station early on Saturday morning. 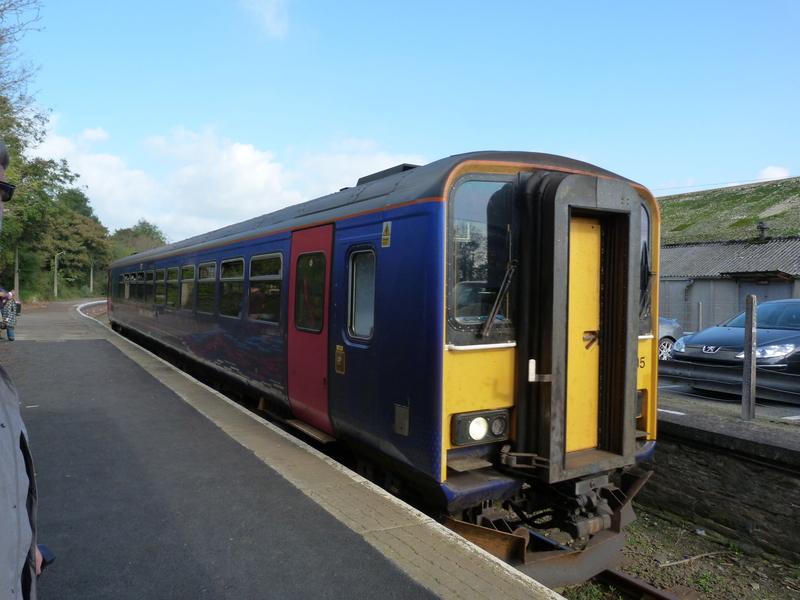 The main train took 3 hours to get us to Liskard where we changed to a branch route to go to Looe. The train to Looe was a tiny one-car train that went through leafy green woods, right beside a flowing stream. After 5 minutes of going forward, the train stopped and the driver left the front engine, walked through the train, and started driving in the other direction. We thought at first that he was heading back to Liskard, but apparently he was just going onto another track from a siding. Within another 10 minutes we were in Looe. 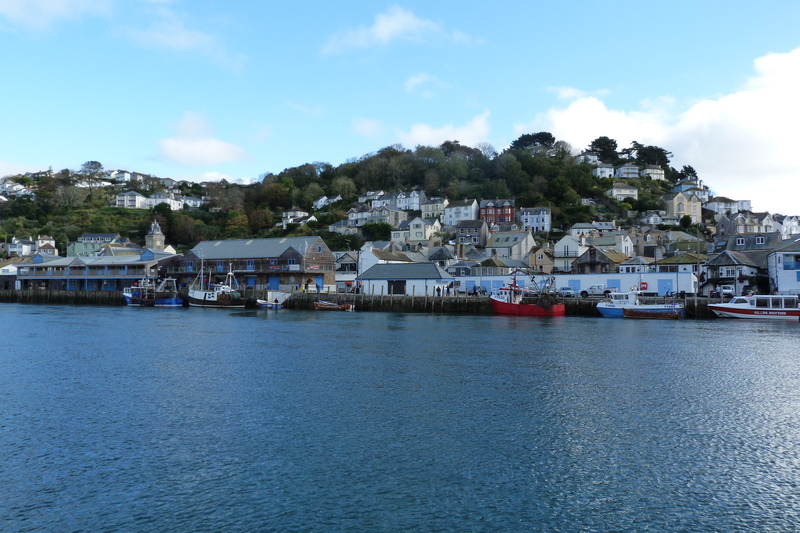 Looe is actually comprised of two villages – East Looe and West Looe – each wrapping around the small harbour. They were connected in 1411 when an estuary bridge was built. The current bridge was built in 1853. East Looe is the main commercial village filled with shops. West Looe is quieter and is primarily filled with accommodations. 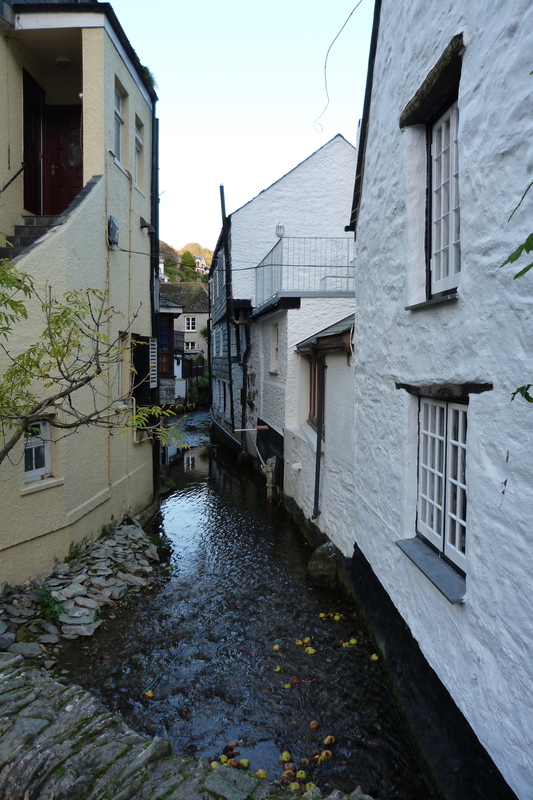 Our cottage in West Looe is up a quiet, narrow, twisty street. It is a small two-story structure attached to a row house, and we enter below ground level. It is very dark (the bathroom is the sunniest room in the house) and has virtually no views out of any windows. But it is cozy and clean and private. It has a well-appointed kitchen, which is really the best feature as we are planning on cooking a lot of fresh fish. The harbor is around the corner and to get to the shops in East Looe we can either walk around the harbor (about 5 minutes) or take a “ferry” (one man in a motor boat) for 40p (1 minute trip). 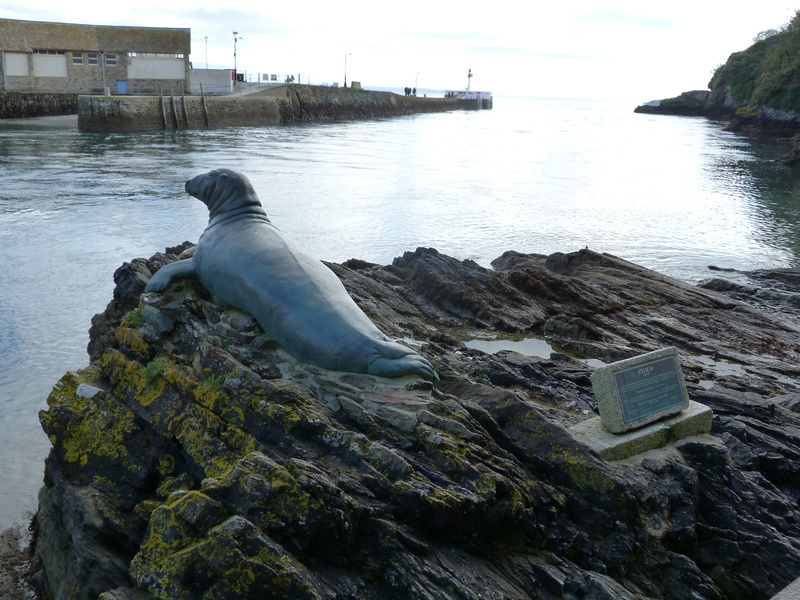 One of my favourite things on the West Looe side of the harbor is a dedication to “Nelson”, a distinctive, “one-eyed” Grey Seal who was well known along the Cornish coast for over 25 years. The statue of "Nelson" in the harbour in West Looe. He eventually “settled” on the rocks in Looe and the “Grand Old Man of the Sea” was apparently fed by local fishermen, villagers and visitors and was a great favourite of all. 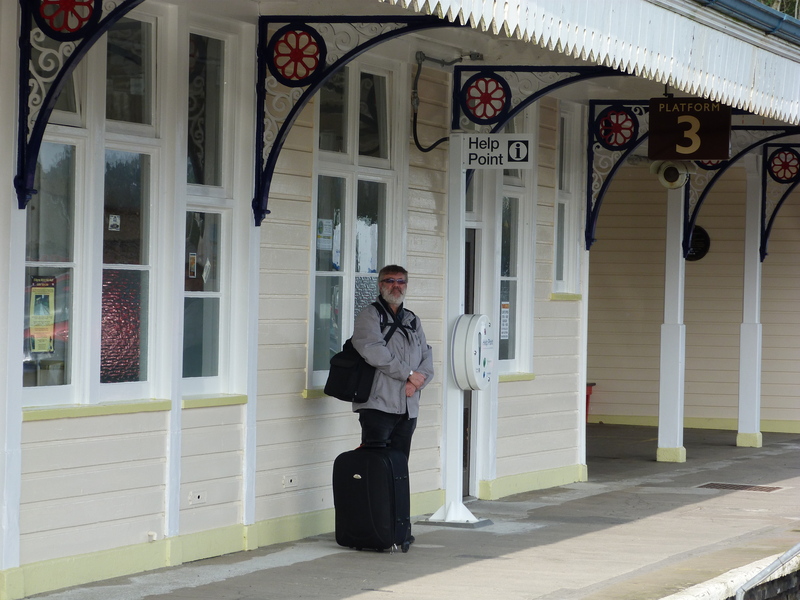 After settling into Horton Cottage, we were anxious to walk about and get a sense of the town and points beyond. It was a warm and sunny Saturday, the tide was out and the beach was filled with families and laughter. 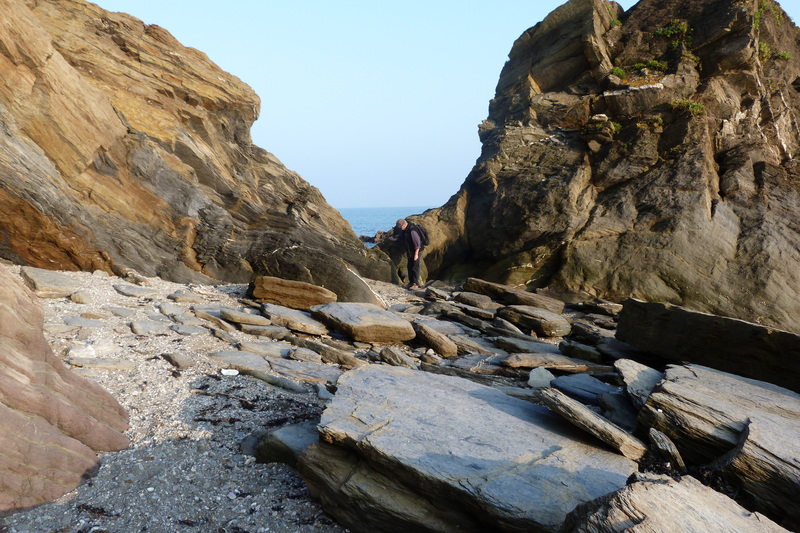 We walked a mile along the eastern coastal path to get our bearings, marveling at the rock formations and the quiet. Rocks along the shore. Tim is in the centre of the picture for scale. We hadn’t realized how much we missed vistas and fresh air. Back in the village, we watched children set up around the edge of the harbor catching crabs just for the fun of it. They lowered little bait packages down into the water and then reeled them up covered in small (3 inch) crabs, which they put into buckets of fresh seawater. Inevitably, some crabs got away, and the kids squealed as they tried to catch them on the dock. The competition was in the number of crabs caught in any one lift (“Look, Look! I’ve got 5!!!). They were all released 15 minutes later. Beside the dock, the tide was coming back in and so were the boats, laden with fish – John Dory, mackerel, lemon sole, crabs, halibut – to unload at the commercial market beside the dock. Looks like it has been a good day. Gulls cried overhead as we strolled lazily back to Horton Cottage.